Today’s the day… that UNIT falls." The Seventh Doctor’s five-release-run in the Main Range from Big Finish continues here with Warlock’s Cross by Steve Lyons; the final play in the ‘New UNIT’ trilogy. It’s a bit of an odd play for various reasons, but we’ll get to that in a bit. Things kick off with some set up and well-executed exposition (sometimes a rarity in audio). The Doctor himself is sidelined fairly early into proceedings with a nice gag on how he wasn’t really much of a player in the 1990s, and it’s not long before all the main players are established, including the return of Blake Harrison as Daniel Hopkins and Tracey Childs as Klein. They are joined by others along the way, but it’s Colonel McKenna who takes central stage. He is the man in charge now and proves to be as waspish as he predecessors; the moment he name-checks Lewis Price as the best of the best is a nice shorthand for everything you need to know about his character. By the end of the first episode, we’ve a mystery to solve, a jailbreak, betrayal and uncertainty over some characters’ motivations. It’s a lot to work with, so it’s a surprise then that the episode itself is a bit of a damp squib. Much happens, but not an awful lot of it is all that interesting. The same goes for Part Two, which had me concerned. The previous two entries in this trilogy have failed to land for me and I was very concerned this one was heading the same way. Thankfully, we have here a Doctor Who story which bucks the trend by actually improving as it goes along and Part Three in particular is enjoyable with some fun concepts. Part Four is perhaps more pedestrian, but Lyons throws us some nice bones here and there with interesting character development for Klein and weighty discussion on what the Doctor did to her by interfering with her past. It helps justify her inclusion in the play, which otherwise would be hard to do, regardless of how good Childs is in the role (and she is: she’s very, very good). A lot of the issues at the start of the story really boil down to the performances of some of the cast, but a lot of that is down presumably to directorial decision and tics in the script itself. It’s very similar to the problem with Ashildr back with Series 10 on television. If you write a character as having a tough exterior and being emotionless, the performances given are going to lack warmth and subtlety and so it is here, too. The actors in this cast are very good actors but I would be lying if I said I felt they gave us incredible performances. I don’t feel that’s really something they can be entirely blamed for though, especially when it comes to the character of Hopkins. It’s a decision taken at a higher level, to make him the way he is, and it’s made for a very bland character that you wish had been flagged up as a misstep somewhere down the scripting or script editing road. Compare Blake Harrison’s performance here to that in The Helliax Rift. I didn’t enjoy that play, but it’s fair to say Harrison had a lot more to go with and his performance is accordingly better for it. Harrison is a good actor, but saddled as he is here with scripts and character development that are lacking, it’s a wonder he does as well as he does. In the end, the decision to go down the route they did with Hopkins weighs down the New UNIT trilogy, a trilogy which has felt ill-conceived and poorly executed from the start. I can see where they were aiming with it all (UNIT in Battlefield, for example, feels very different to how UNIT was in the Pertwee era or indeed Tennant’s, Smith’s or Capaldi’s) but it lacked the believability to really make it sing, populated by characters who should know better when dealing with the Doctor and stories that feel largely tired. The 1990s were not the kindest of times to Doctor Who in many ways and perhaps ending the trilogy in this era rubbed off. Warlock’s Cross is by far the best of the three in the loose arc, but I don’t think it’s a play I’ll be returning to any time soon. 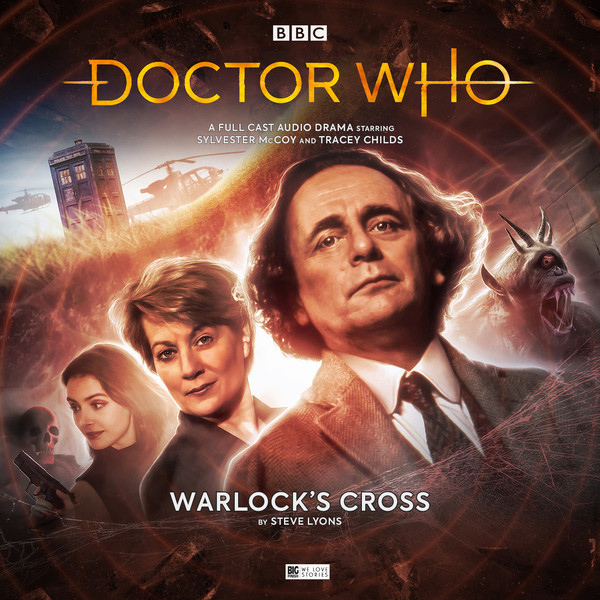 + Warlock's Cross is OUT NOW, priced £14.99 (CD) / £12.99 (Download). + ORDER this title on Amazon!